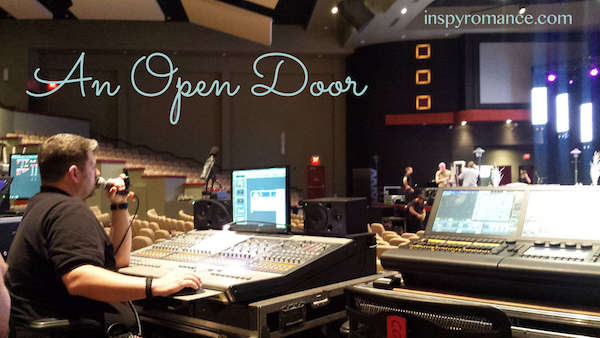 There are times when being an “author” open doors for you. I used to hesitate to make the call for research purposes, because I always thought that the person on the other end of the phone would think I was insane. But the more I’ve done it, the more comfort I have in just stepping forward and calling (even though I still think the person I’m speaking to will think I’m insane). For instance, a few weeks ago, I called a church where I’d seen the Air1 Positive Hits Tour with David Crowder and several other bands. It was the perfect venue for a scene in my upcoming novel, A HARMONY FOR STEVE. I’ve learned that people LOVE to provide authors with research opportunities! It’s wonderful! 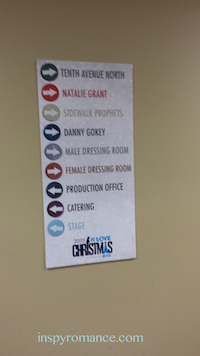 In no time, I was touring the backstage area, talking to the facilities manager, marking things on a map, and had arrangements to come spend the day at the church for the K-Love Christmas Tour with full access backstage passes. I arrived at the church at 8:00 in the morning and stayed until the concert started. I toured one of the tour buses, spoke to several of the crew members, watched them set up the stage for the concert, watched what they did with the catering areas and dressing rooms, watched the merchandise area set up, and sat through the sound check. I met band members and the people who put the tour together. I was able to take pictures, talk to volunteers, and do what I love to do most — observe. It was a full 12-hour day and I came out of there with a million more ideas than I had when I went in. I told someone I was speaking to that it seemed like a lot of effort for a single scene in a 100K word novel, but I have so much valuable information and now have knowledge that I’ll be able to take it and use in books for as long as I write. It was an incredible experience — one that I never would have had if I hadn’t picked up the phone and made that phone call. Look for A HARMONY FOR STEVE, book 4 in the Song of Suspense Series, in early 2016. I understand, I think I love research as much as writing.To me research is the meat and potatoes of any book. This was a very insightful blog post. Many yeas ago now, when doing research I too was very wary of contacting folk I did not know. I have found what you shared in your post here so very true, Hallee. One thing I am very glad I was warned of early in my writing career was to immediately mention on phone call who I was and why I was ringing. Most important was to ask something like, “Is it convenient right now for you to answer a few questions for me?” Although a few times I could hear amusement in the voice speaking to me, I was never made to feel a nuisance or stupid. I think one the most unusual research calls I made was to a local aerodrome to try and find out facts about helicopters for scenes in my Return to Baragula book, especially how long it would take for a helicopter to travel a certain distance. I’ve also been quite amazed – and humbled – by the times the Lord has organised some folk I could freely ask rather sensitive questions. One was getting to know a local Christian policeman who even agreed to read parts of my manuscripts to try and “get it right” in those Baragula books. What a cool experience! I still struggle with approaching people about research, but now that I think about it, everyone so far has been very gracious. Loved hearing about your experience. I would think research would be the fun part of creating characters and places and actions. At the same time I think I would be hesitant about asking. I am glad your 12 hour day was such a great informative experience. I will look forward to reading that book. Have a wonderful Christmas. I’m happy you were able to put aside your fear of calling. I’m glad you had a great time. 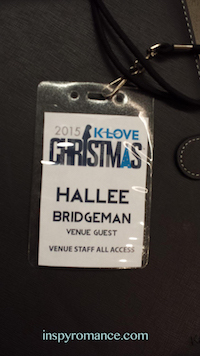 I’ve been backstage at several events like that because Jeff Owen from Tenth Ave. North is my nephew. I have found it really interesting and fun to be backstage, but the most impressive part is that all those artist are truly downhome, Godly people. They truly love God and desire to bring Him glory. Interesting post on what authors do to make their books the best that they can be! There are so many good writers out there! I’m not a huge fan of research, but I could get into it if it involved David Crowder! My fav!! Anyway, what a great experience. And while not everything you saw will go into your book, what does go in will enhance the reader’s experience in an amazing way. We do need to step out! Thanks for sharing. It sounds like you did have a fabulous day observing the crew there in the back of the Church and even on the bus outside! I can understand some of your original hesitation to call about observing/asking questions to help you with your book. But it’s truly delightful to hear how wonderfully some respond to give you the help you need. Thanks for sharing! Merry Christmas to you and yours! Hallee, that is so cool! I need to bite the bullet and just call more often. I’m always very timid about it.